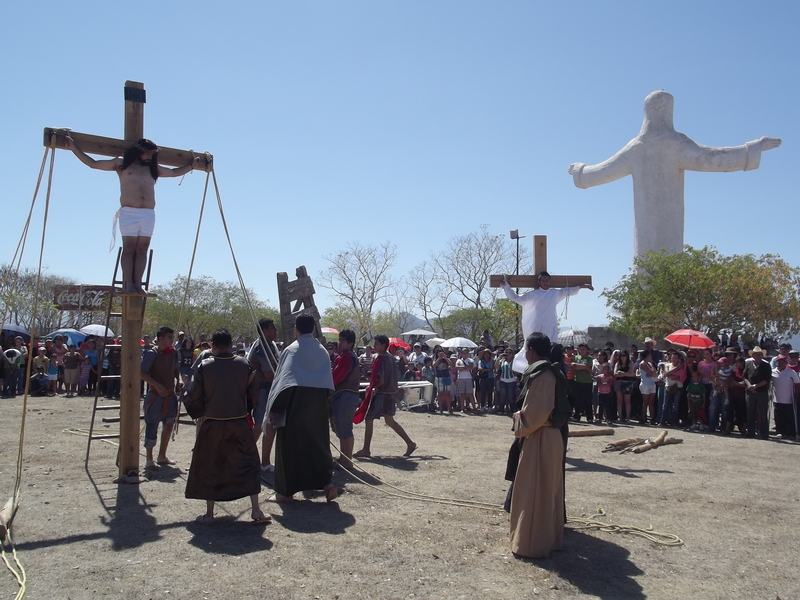 Religious Tourism in Mazatlán and the Nearby Towns During Holy Week | ¡VidaMaz! 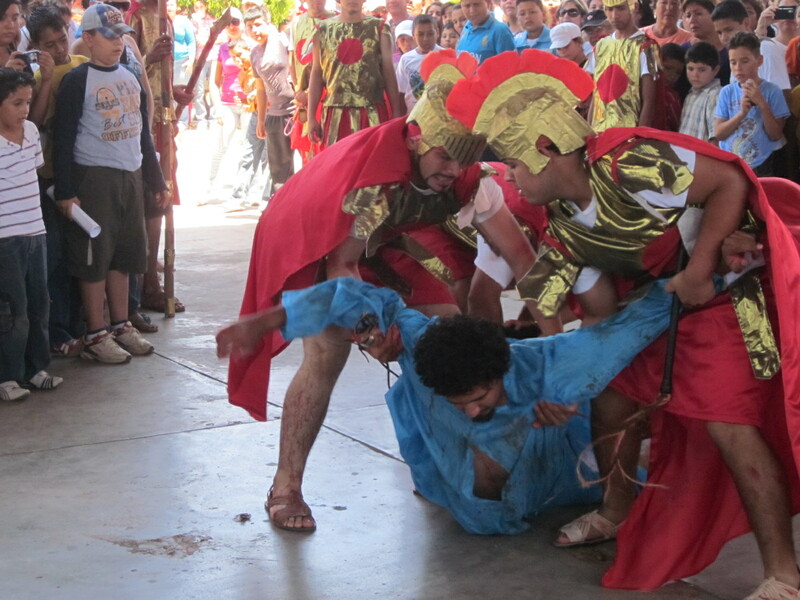 I took this photo during the Vía Crucis/Stations of the Cross of PAJUMA Mazatlán (Diocesan youth group). It is taken from the top of the lighthouse after the celebration of an open-air mass. Unfortunately this event does not happen every year. When I arrived in México I couldn’t wait to participate in some of the incredible Holy Week religious events that I had so long heard about and seen—especially those that re-create Jesus’ long walk to the cross, the Via Dolorosa. Do you know that there is a long tradition of beautiful Holy Week events right here in Mazatlán and the surrounding towns? Kindly, our friends over at Mazatlán Interactivo have agreed to permit us to use their photos and legwork to share with you some of what is available right here in southern Sinaloa. The biggest events locally take place on Good Friday, which this year falls on March 29, 2013. The reenactments of the crucifixion are generally held late in the morning. These involve members of local parishes dressing up in period costume and acting out the 14 Stations of the Cross. This can get very graphic, with realistically simulated whipping, nailing of hands and feet, and bleeding. It is a beautiful and very moving sight to behold, and I highly recommend you experience it. The actors’ lines come directly from Bible verses. In some communities there is also a Procession of Silence after darkness sets in on Good Friday. Members of the community process through the streets holding lit candles and religious relics. Often there is solemn music and the procession is followed by a mass. Here in Mazatlán the Diocesan youth group annually conducts PAJUMA (Pascua Juveníl de Mazatlán) a three-day event that takes place in the baseball stadium Estadio Teodoro Mariscal on Maundy Thursday, Good Friday and Holy Saturday (March 28-30, 9 am – 7 pm each day). The full three days’ attendance is only 50 pesos, and there is no age limit on participation. The kids reenact the crucifixion of Christ there in the stadium and then, still fully dressed, process from the stadium to the cathedral. 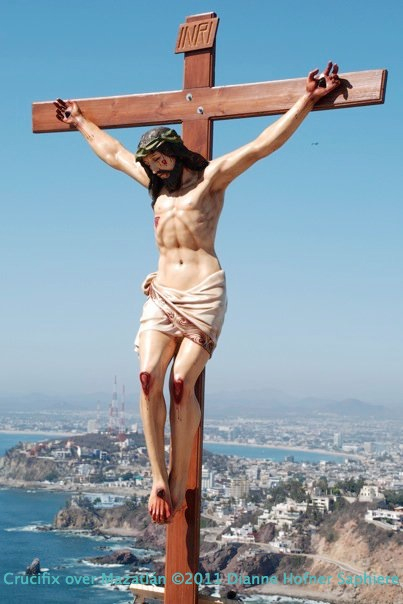 PAJUMA participants will leave the baseball stadium at 5:00 and head out to the cathedral of the Immaculate Conception downtown, passing by the Aquarium, along the malecón (not many places in the world you can see a Way of the Cross enacted along the oceanfront! ), the Fisherman’s Monument, and the pangas in Playa Norte. The procession will then turn left and go down through Plaza Zaragoza to the cathedral. Mass of the Resurrection of our Lord, and then the closing of Pascua Juveníl de Mazatlán. Entrance is free after 5:00. Pretty much every church in the city will have Stations of the Cross on Good Friday, and a vigil with foot washing Thursday evening. Plus, of course, Easter mass. Some congregations reenact the Vía Crucis as well; check with your local parish. Mouseover a photo above to view the caption, or click on one to view the slideshow. Mouseover a photo below to view the caption, or click on one to view the slideshow. Reenactment of the crucifixion of Christ, starting from the moment Judas Iscariot kisses him and Jesus is apprehended into custody in the Garden of Gesthemane. Reenactment of the crucifixion of Christ as he made his way to Golgotha. Our good friends, the reason we ended up loving and living in Mazatlán in the first place, are originally from San Ignacio. It is a gorgeous small town with a huge image of Christ on the hill. Reenactment of the crucifixion of Christ, the Via Dolorosa or Way of the Cross. Reenactment of the crucifixion of Christ and his walk to Calvary. Pingback: San Ignacio: Lovely mountain town one hour from Mazatlán | ¡VidaMaz!